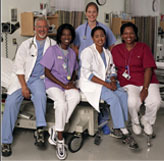 Culture Connect, Inc. will offer Culturesmart’s 45-Hour Medical Interpreter Training Course at Piedmont Hospital, Atlanta, GA.
Culturesmart and Quincy Medical Center (QMC) have partnered to offer a 45-Hour Medical Interpreter Training Course at Quincy Medical Center, 114 Whitwell Street, Quincy. 10/18/07 Industry News: For the second year in a row, Culturesmart develops and publishes interpreter wages and rates survey for the International Medical Interpreters Association (IMIA). Please note that all information presented in this compensation survey is self-reported and the IMIA and Culturesmart make no claim as to the validity of the responses. Also, as with any national survey, the distribution of survey respondents is not uniform, and the results reflect the total number of respondents. These results can be filtered by state or other parameters, but please notice that in some instances the number of respondents will prevent you from obtaining reliable data. 8/28/06 Culturesmart is offering The Essential Piece medical interpreter training in Newton, MA in January 2007. The training will take place at Newton-Wellesley Hospital in Newton, MA. 5/30/06 Judy Kanter, M.Ed. of Culturesmart chosen in the inaugural group of trainers of the National Medical Interpreter Project for Children's Hospitals. 3/23/06 Culturesmart's Essential Piece™ training to be offered in the Fall River / New Bedford, MA area. This course is offered free of charge to qualified applicants. "It�s important to learn to be a bridge in an unobtrusive way and to understand ethical behavior. This has helped me set my goals."